The Australia-based band, The Paper Kites, brought their sense of magic to the House of Blues San Diego. With their rock-folk and woodsy forest vibes, the members tend to use their harmonies and magical lyrics to create a mood that you are immersed in the song, feeling everything the words were intended to have — even if you have never heard the song before! Sam Bentley (vocals, guitars and keyboards), Christina Lacy (vocals, guitars and keyboards), David Powys (vocals, guitars, banjo and lap steel guitar), Josh Bentley (drums and percussion) and Sam Rasmussen (bass and synthesizers) make up The Paper Kites and the beautiful music they make. ‘Deep Burn Blue’ followed ‘Red Light’ funnily enough. This song is about the feelings inside you and your own thoughts that make you not want to leave your own room. It’s as if you are afraid of what the world has to offer. Lead singer Sam put it himself that “music is so much more purposeful and devastating when it makes you feel exposed.” “Revelator Eyes” from twelvefour followed this. It is a song where the person is still trying to hold on to their relationship even though they can notice that their partner is not feeling the love anymore. The theme of the show at this point was following a relationship, which I’m sure many people in the audience could relate to. The song “On The Corner Where You Live” is about saying goodbye even when that isn’t what you want to do. They continued this feeling of hurt with the song ‘When It Hurts You’, a powerful rock ballad about not wanting to hurt your loved one because you will feel the pain too. 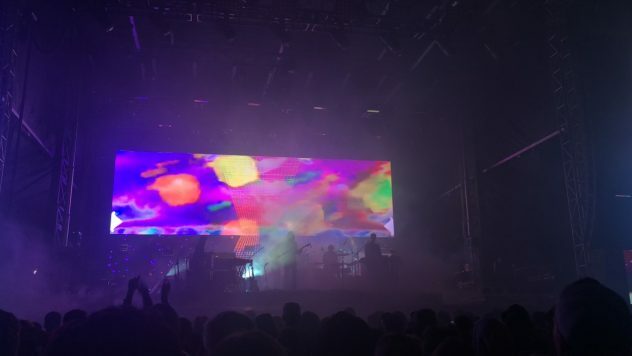 I closed my eyes during this and the one following it, ‘Bloom’, which made the room feel like we were all one. It is the song of hope, and the band played it slowly instead of at the fast pace that we are all used to. It was a perfect triage of songs to follow the relationship we were all pretending we knew. ‘Bloom’ was the first song I ever heard by The Paper Kites so I really felt in that moment how far the band has come and who they have developed to be. It is still so surreal to me that the track ‘Bloom’, their most popular song, was made as a bonus track release with the first EP they made. They had no idea it would be so successful. 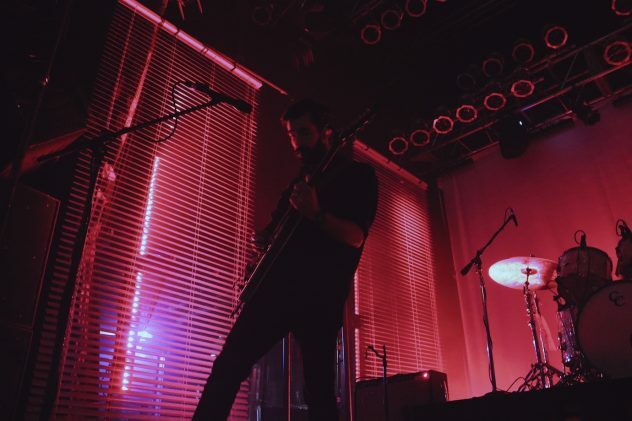 The Paper Kites emphasize continuously in their music that sometimes you have to let go (‘On The Corner Where You Live’), and although it hurts (‘When It Hurts You’), something good can come out of everything (‘Bloom’). 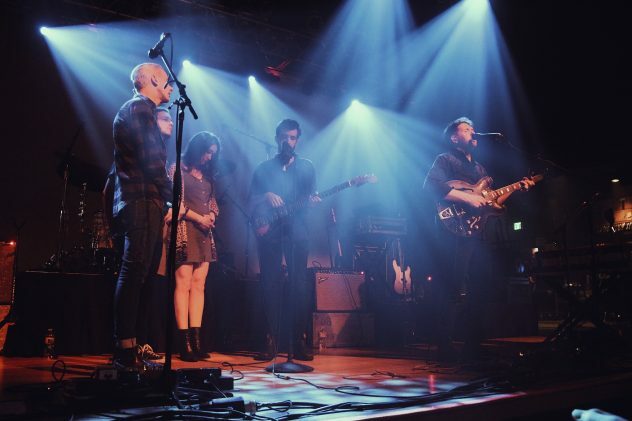 The Paper Kites included an intermission song, which was the track for ‘A Gathering On 57th’. It gave the audience chills and a familiar feeling of nostalgia. I have always felt with that song that I am on a train visiting family or on my way to see someone I love. 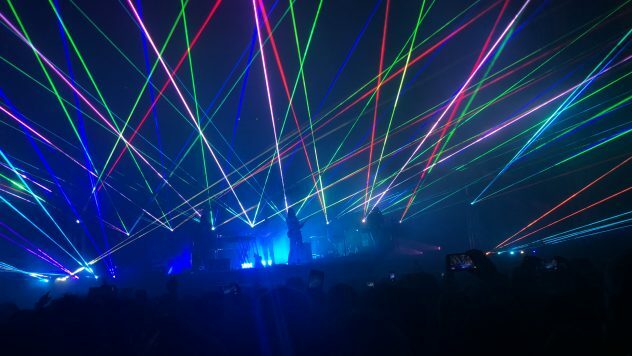 ‘Give Me Your Fire, Give Me Your Rain’ began after the interlude, and the crowd was back to its’ original excitement and swaying. ‘On The Train Ride Home’, the song from its’ self titled album is a personal favorite. It has a great deep meaning behind the simpleness of it. “If I can’t get the things I want, then give me what I need.” With a feeling of loss under the lyrics. This song may be about the chapter of our lives where we cannot find our true direction, where most of us are not able to handle the pressure to ourselves as we go to face the reality and so we try to go back to our home where we were once settled and happy. The train is a metaphor for our means to go back and within it we try to ask for help. Some highlights to this show include their performances of “Electric Indigo,” and “Don’t Keep Driving” which they ended with. In the end, the audience was filled with a yearning and a desire to stay in that room forever. I would definitely see The Paper Kites again if I had the chance. Their songs are so deeply personal, and I would recommend listening to their music if you are going through anything. I’m excited to see what is coming next with this band and where they will take us on their journey. 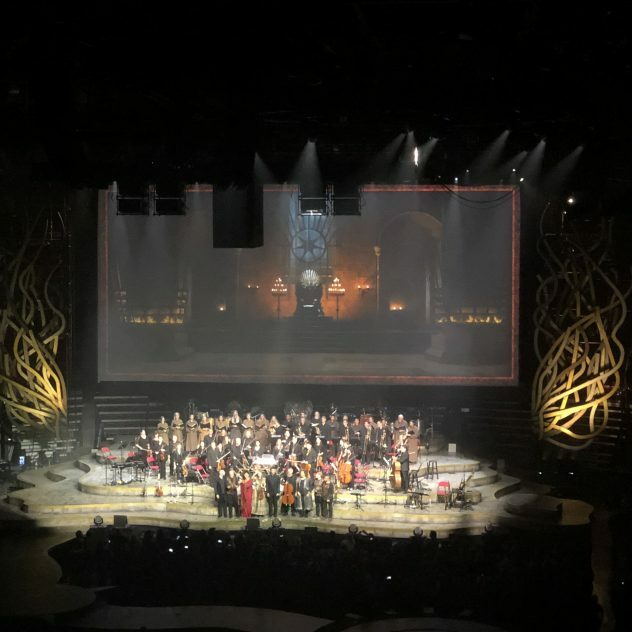 Game of Thrones Live at the Viejas Arena was a phenomenal experience which allowed fans to relive all the highlights from the series. If you don’t watch Game of Thrones… you are definitely missing out! After the concert, my excitement for season 8 has reached unprecedented heights. For those unfamiliar, German composer Ramin Djawadi is the mind behind all the beautiful, heartbreaking, and intense scores we hear during the show that always leaves us wanting more. In addition to his work on Game of Thrones, Djawadi attended Berklee College of Music, worked with Hans Zimmer. and even won an Emmy for his work on the Season 7 Finale “The Dragon and the Wolf.” His contributions to Game of Thrones are embedded within the show’s DNA; Just as the characters and houses have evolved over time, so too has his themes. For example, Daenerys Targaryen’s theme started small, but became progressively more powerful after each season. Daenerys has proven herself to be a “Khaleesi” to many, so it’s only fitting her song grew with her. Her theme was initially built with only a cello, and has progressed into the powerful and strong song that it is now. During the concert, as Daenerys became stronger, she would say ‘dracarys’ and the stage would glow in flames. Djawadi conducted an 80-piece orchestra along with a local choir. The set up included a screen that projected the show and multiple stages that separated parts of the world in the series. There was a stage dedicated to King’s Landing and one to Winterfell, with the Iron Throne directly in the middle. Several soloists surrounded the stage, each dedicating their mastery to a specific song. Violin soloist Molly Rogers performed the House Stark theme while ascending into the air with a huge dress on, as rose petals fell from the sky! Some instruments were even specially crafted for the tour, including a 14-ft Wildling horn, which was used during a scene on the attack of the Wall. 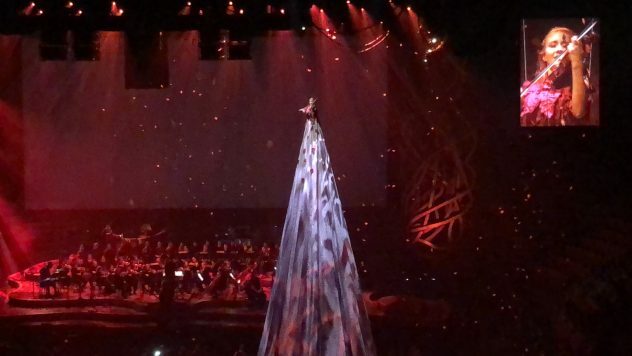 A lovely soloist brought fans to heaven (and tears) when they heard “The Rains of Castamere.” With scenes as heartwarming as Ygritte and Jon Snow’s cave scene, to the bloody and heart wrenching The Red Wedding, you are thrown headfirst into the very best moments of Game of Thrones. 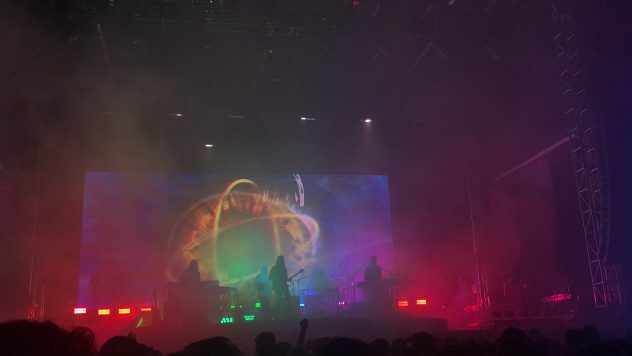 As “The Light of the Seven” was playing, the whole audience held their breath knowing the Wildfire was about to be lit. I intensely cried during a specific scene of Hodor’s (if you know, you know) as my fellow KCR member Peter Swan comforted me. During the show, Djawadi even admitted that he had to write the music for season 7 before the writing for the show was even released. He also acknowledged that putting together the Game of Thrones Live Tour took over 3 years. This means they were continuously adding the music as the show was being released! I am extremely lucky to have had this opportunity to see Ramin Djawadi in action and the unique experience of how the series was brought to life. If you ever have the opportunity to see or hear Djawadi’s work, whether from Game of Thrones, or any of his other work, I strongly recommend it.